Sunrise Lake Beach Club and Camp Sunrise Lake are looking for positive, energetic and caring applicants to make the Summer 2019 season the best one yet! 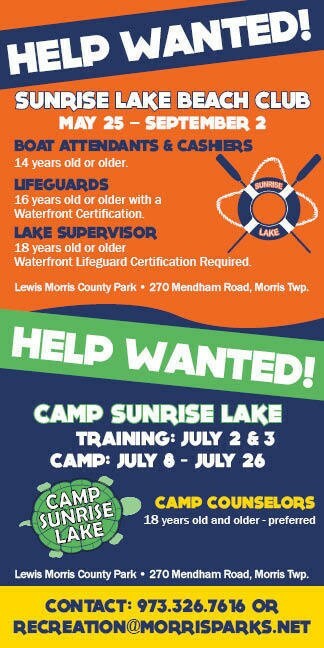 Available positions include Boat Attendants and Cashiers (14 & up), Lifeguards (16 & up), and Camp Counselors (18 & up). For more info, please call 973.326.7616, or e-mail recreation@morrisparks.net.